Two years after Hurricane Sandy ravaged the East Coast, scientists in New Jersey are working on a forecasting system that will let residents know three days before a storm hits whether their street is likely to flood. Alan Blumberg is the director of the Center for Maritime Systems at Stevens Institute of Technology in Hoboken, N.J. and founder of the New York Harbor Observing and Prediction System (NYHOPS). He and the NYHOPS team, which includes Alex Washburn, New York City's former chief urban designer under mayor Michael Bloomberg, are readying to install 26 high-tech sensors in the waters around New York and New Jersey to monitor coastal conditions. The data they collect will inform predictions of storm activity that will be publicly available on the Internet. By making the data public online, Blumberg told CBS News the system will enable people to make their own informed decisions about how to respond to reports of severe weather. "It will be open so that you'll be able to see your street and see what is likely to happen to you," he said. "I don't like when the government just says, 'evacuate.'" The sensors will be placed at strategic points around New York and New Jersey, largely at sites owned by the Port Authority of New York & New Jersey, which is funding the project with a five-year, $6.6 million grant. Some of the locations flagged are the PATH train station in Hoboken, a stone's throw from the Hudson River; Newark Liberty, LaGuardia and John F. Kennedy International airports; the entrances to the Holland and Lincoln tunnels, which connect New York City and New Jersey under the Hudson; and near Battery Park in lower Manhattan. 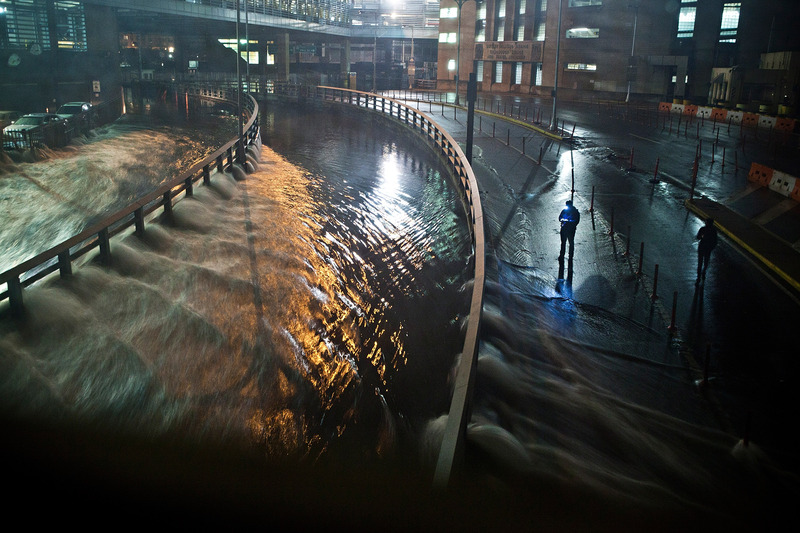 New York area airports were closed for days after Sandy hit October 29, 2012. LaGuardia's runways sat under a foot of water. The southern parts of Manhattan were paralyzed by the flooding. Stevens already has about ten sensors in the waters between and around the two states, which have been there since the late 1990s. They also have access to data from nearly 200 others in the region that are owned by other research and government institutions. These gather information on the way water moves through the system. They were active during Sandy and allowed scientists to make predictions about what was going to happen. But the predictions weren't exact. "The storm surge was nine feet above ground here in Hoboken," Blumberg recalled. "We predicted it at about eight feet, so we were about a foot low." The new sensors, he explained, will not only be more precise, but will also offer an opportunity to make site-specific forecasts: "What will happen in New York Harbor? What will happen to the beaches in New Jersey? Water on the land in lower Manhattan, in Hoboken? Forecasts at that level have never been done before." His team will begin installing the sensors by the end of November. Once in place, they will record water level, temperature and salinity every six minutes. Each sensor will be outfitted with a cellular modem, which will transmit the data to Stevens' data center. There, it will be combined with wind forecasts gathered from as many as 10 weather centers on the East Coast and in Europe to create a model of what's to come 72 hours into the future. Those forecasts will be posted on the NYHOPS website. Blumberg recounted an anecdote about taxi drivers near the PATH station in Hoboken during Sandy. Upon hearing that the station was likely to flood, they decided to move to another location and picked a spot that ended up getting hit even harder. It's these mistakes that Blumberg hopes to avoid by giving everyone access to reliable, street-by-street forecasts. The sensors should be in place in about six months, and the researchers will spend the following two to three years improving their forecasting and testing their models. Then there's one more thing the project will require: "We have to have a better website," Blumberg admitted. "That's built into the plan." He recently proposed an idea to Google to build an interactive flood map. Working title: Google Crisis.